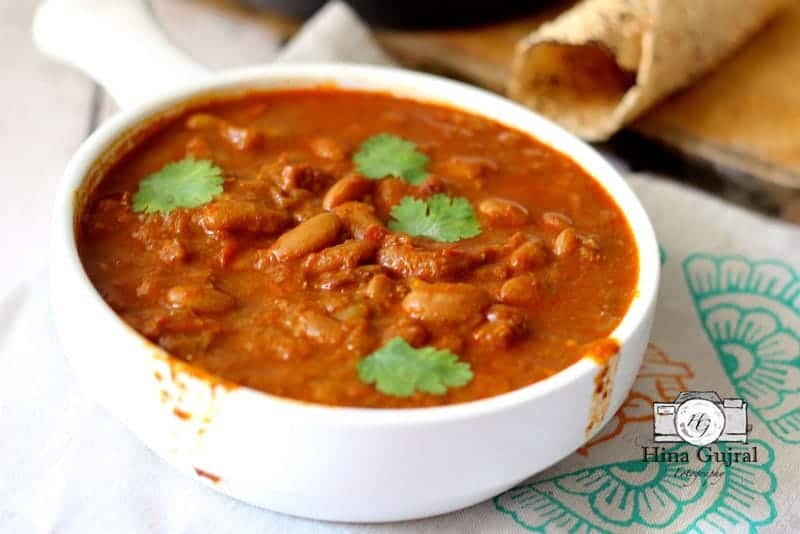 Punjabi Rajma Masala is one of the delicious and most popular Indian curry recipes. 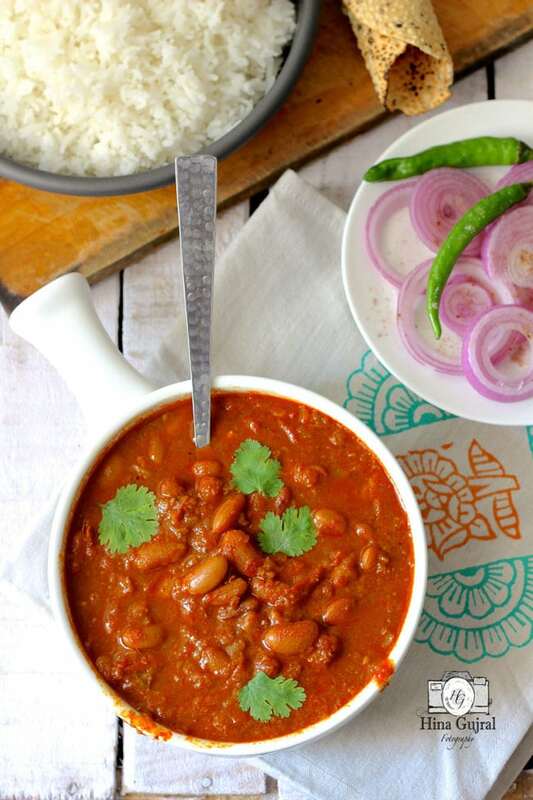 The red kidney beans (rajma) cooked in a rich tomato based gravy and served with steamed rice, called as rajma chawal. And needless, to say this combination is the ultimate definition of Indian comfort food at its best. To say rajma masala is one of the best Indian curries is an understatement. 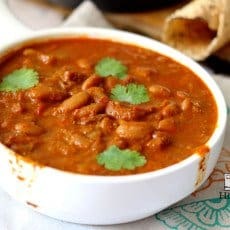 This recipe of rajma masala was passed on to me by my mother-in-law and trust me when I say this, it is the quickest and delicious of all the rajma chawal recipes. It’s astonishingly straightforward – and no tons of spices required to make it finger-licking good. All you need is a pressure cooker, chopped tomatoes and onion, little bit of time and a true Punjabi style rajma chawal is on the table. It is surely an easiest one of all the Indian curries. How much I love rajma chawal? It is one of my favourite lunch-time meal combinations. Not only me, all the members of my family can devour a plate full of it during any hour of the day. The best way to enjoy rajma masala is to add a ladle full of curry over the steamed basmati rice, top it with loads of chopped onion, green chutney and dig in. There is no other sophisticated or a more gratifying way to relish rajma chawal. A simple mix of spices, onion and tomatoes is the only secret weapon for this incredibly easy rajma curry. That is gluten-free, vegan and 100% vegetarian. The curry pairs beautifully with steamed rice, jeera rice, peas pulao or phulka. I have used my signature garam masala powder in this recipe to give the flavours a special kick. The aroma of homemade garam masala combined with the thick and luscious gravy creates a totally divine amalgamation of flavours. Hence, making rajma truly irresistible. What are the delicious Punjabi foods? The Punjabi community of India is truly food lover. The everyday meal in each Punjabi household is a serious business and is a treat for the culinary senses. If you love robust, bold, spicy and flavoursome Indian curries then Punjabi cuisine could be your favourite one. 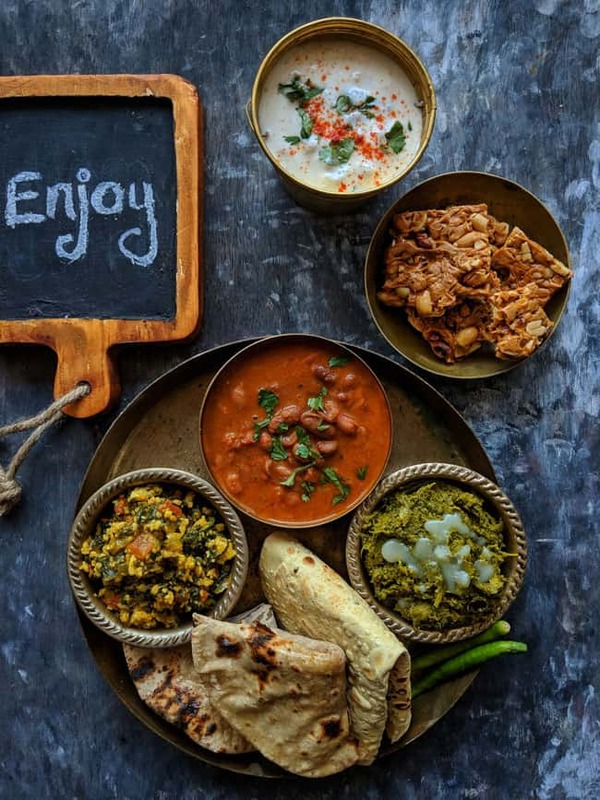 The few of the popular and delicious Punjabi dishes are – Chana Masala, Butter Chicken, Dal Makhani, Rajma Chawal, Kadhi Pakora, Kadha Prasad, and Meethe Chawal. These are few of the Punjabi dishes served at Indian restaurants worldwide. But apart from these sought-after dishes, there are tons of simple vegetarian curries that are cooked on a routine basis in each Punjabi family. Which is the better food between rajma and dal makhani? It is really a tough one to answer. A true Punjabi fairly loves both. In my family, dal makhani is usually a dinner time special whereas rajma chawal is the perfect weekend lunch menu. Both of these Punjabi dishes are widely popular among the food lovers and equally loved to the core. If you would ask for my vote, it is always in the favour of rajma chawal. And let’s not forget the butter chicken, when we are talking about the popular Punjabi dishes. That is my favourite too! Back to the recipe – my method of making rajma curry is a bit unconventional. Because most of the rajma recipes will ask you to roast the chopped tomato before adding the red kidney beans. But in this recipe, we are not roasting/frying the tomatoes. Instead, we add them along with the soaked beans just before closing the lid of the pressure cooker. There is no scientific reason for following this step but it always does some kind of magic to the gravy. Making it totally delectable and distinct. Also, it saves me lot of time. 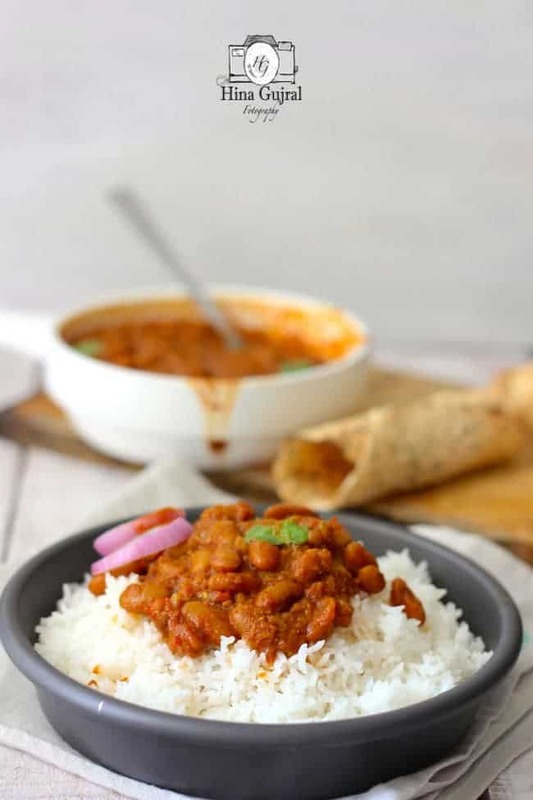 This recipe is totally a no fuss one and you will have a bright and luscious restaurant style rajma chawal without breaking sweat near the gas stove. Rajma Masala is a popular Indian curry. It is cooked in a rich tomato based gravy and served with rice called as rajma chawal. 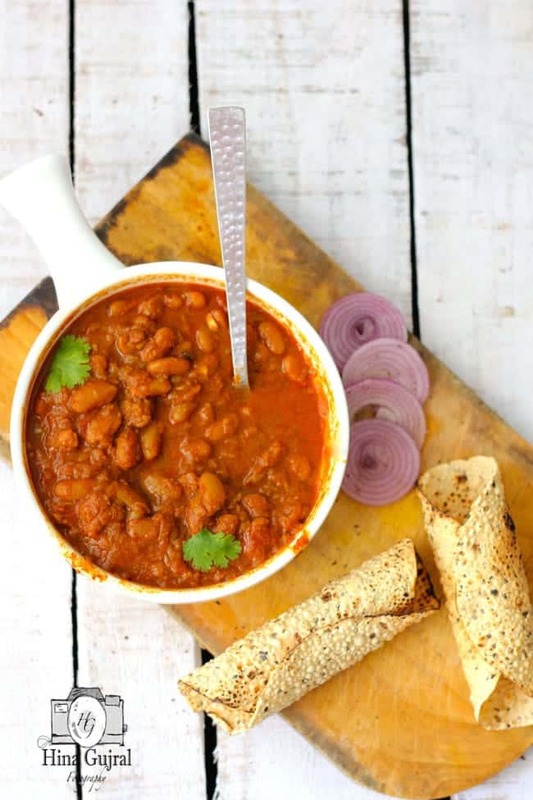 Learn how to make Punjabi stye rajma in this easy step by step video. Rinse and soak the red kidney beans in enough water for 1 - 2 hours. After 2 hours, discard the water and drain beans in a colander. Set aside. In a pressure cooker heat oil over medium heat. Add the chopped onions, asafoetida and ginger-garlic paste, saute till onion turn caramelized and light brown in colour. Keep on stirring the onions while sauteing them, for uniform cooking and also so that they don't get burnt. Next, add the drained beans in the pressure cooker along with salt, chopped tomato and turmeric powder. Stir to combine and saute the mixture for 2 - 3 minutes. Add the 4 Cups of water to the pressure cooker, close the lid, put the weight and let beans cook over medium heat for 2 - 3 whistle. Turn off the heat. Let the steam release naturally from the pressure cooker. 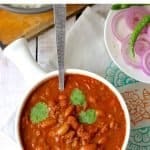 Check if the rajma is cooked or not by taking a bite or pressing a bean. If they are not fully cooked completely, then pressure cook again or simmer over low heat for few more minutes. Meanwhile add some water if required to adjust the consistency of the curry. Simmer rajma masala without a lid for 10 -12 minutes or more till the curry thickens slightly, it should not be watery. Add red chilli powder, garam masala and green chillies. Mix nicely. Mash a few rajma beans with the back of the spoon, this helps to thicken the curry. Serve rajma masala with steamed basmati rice or jeera rice for lunch. Cooking time of rajma may vary according to the quality and size of the bean. It is best to check it for doneness after few whistles. mouth watering…love your cooking and the narration through pictures. I am looking forward to some cookery videos of you coming up really soon. Very nice photos Hina..Love rajma..and the recipe is pretty similar to what I use.. I tried this rajma masala today and it’s yum yum.